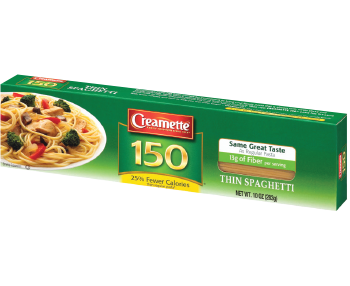 With fewer calories and fiber to help you feel fuller longer, Creamette 150® pasta is a satisfying meal for the whole family. 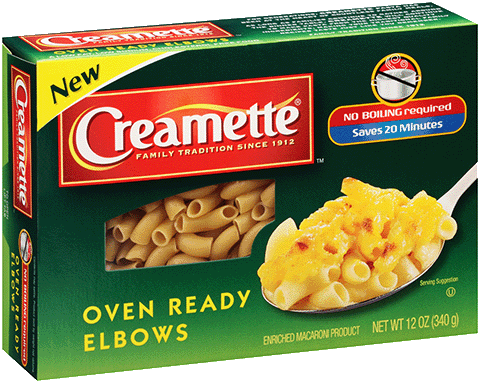 Made from a special blend of wheat flour and extra fiber, Creamette 150® is available in three delicious shapes: penne, rotini and thin spaghetti. Available in 10 oz. SEMOLINA (WHEAT), DURUM FLOUR (WHEAT), MODIFIED WHEAT STARCH, WHEAT FLOUR, NIACIN, FERROUS SULFATE (IRON), THIAMIN MONONITRATE, RIBOFLAVIN, FOLIC ACID.